David Bowie won the Brit award last night for “Best British Male”. Well its about time in my humble opinion and we are all thrilled. In typical DB style he sent Kate Moss dressed in one of his Ziggy Stardust costumes to collect it on his behalf. 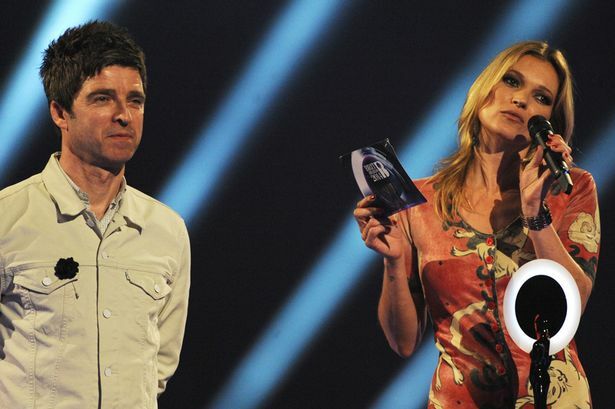 Noel Gallagher was the Presenter and did a stand up job. I guess David likes his shortbread ! This entry was posted in News and tagged Bowie, davidbowie, Gerry Leonard, gerryleonard, news, spookyghost, thenextday. Bookmark the permalink.